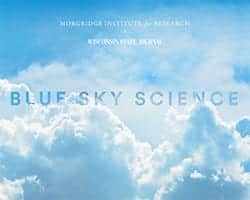 News & Stories > Blue Sky Science > How does virtual reality work? Virtual reality is often talked about in terms of 3D computer graphics or technology. A broader definition says virtual reality is the idea of combining the physical world and the artificial world in such a way that the two are indistinguishable. How could technology provide all of the sensory sensations or different ways that people see, feel and hear the world such that the artificial and physical are blended together? The field of virtual reality does pretty well in terms of visuals, creating computer graphics that look fairly realistic, and can produce sounds that are realistic. The bigger challenges come with senses like touch and smell; does the experience feel realistic, smell realistic? Virtual reality technology is being used in a variety of ways. For example, the Living Environments Lab (LEL) at the Wisconsin Institute for Discovery had an original goal of understanding health in the home environment. When people go to the doctor or go to the hospital, they’re in an ideal environment for taking care of their health, studying health. When people go back home, their environment isn’t necessarily built for healthcare. The LEL decided to create a virtual reality environment that simulates different home environments. The researchers can conduct studies to learn more about how the home environment affects people’s health information management and adherence to doctor’s advice. The researchers go into homes with a technology called LIDAR, which stands for light detection and ranging. The LIDAR scanner can capture the depth and color of everything in a room it can see from its point in space. Once the environments are captured, they’re projected in the six-sided virtual reality CAVE at the LEL. People can navigate through the virtual environments with this tool, and researchers can start understanding which context and cues in the homes environment are motivating people’s health information management. This same technology and methodology could be used to capture and analyze crime scenes, allow architects to visualize their designs in a virtual environment, or even be used as a tool for learning. Could scientists build a virtual brain and body for research?